In Java, an array stores either primitive values (int, char, ...) or references (a.k.a pointers) to objects. 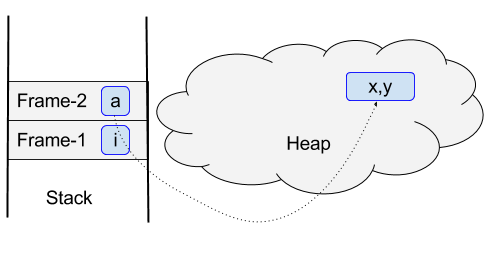 When an object is created by using "new", a memory space is allocated in the heap and a reference is returned. This is also true for arrays, since arrays are objects in Java. The int arr is just the reference to the array of 3 integer. If you create an array with 10 integer, it is the same - an array is allocated and a reference is returned. How about 2-dimensional array? Actually, we can only have one dimensional arrays in Java. A 2-dimension array is just an array of 1-dimension arrays. Multi-dimension arrays are similar as you can image. 3. Where are they located in memory? Arrays are also objects in Java, so how an object looks like in memory applies to an array. As we know that JVM runtime data areas include heap, JVM stack, and others. For a simple example as follows, let's see where the array and its reference are stored. When m1 is invoked, a new frame (Frame-1) is pushed into the stack, and local variable i is also created in Frame-1. 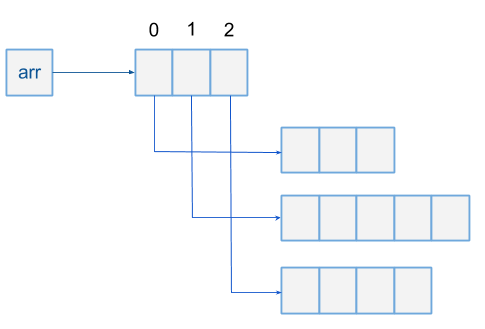 Arrays are treated the same way as objects, so where array are located in memory is straight-forward. What do Java objects look like in memory during run-time? How is an array stored in memory and brought to cache? Array is also class and extends Object. If an array contains primitives, e.g. int, it is still stored in the heap as an array of primitives. An array is a single & contiguous object. When/how it is garbage collected conforms to rules for regular objects – its not reachable from any live threads or any static references. But what do they look like in memory? e.g., for a multidimensional array of primitives, how are contiguity and alignment realized? What about before/after gc? A slight mistake in the figure: Frame-1 should have a rectangle with i, not a. And in Frame-2, the rectangle should contain a, not i.